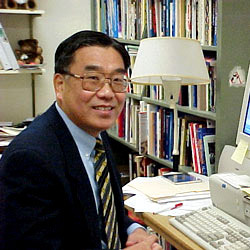 Professor Kim joined the SUNY Plattsburgh faculty in 1985 after teaching at the University of Illinois at Chicago for seven years. His publications appeared in various journals, for example, Communication Monographs, The International Journal of Intercultural Relations, Asian Thought & Society — and books, for example, Distant Mirrors, The Great Debates: Carter vs. Ford, 1976. Professor Kim has been the department chair since 1996.